SOUTHAMPTON, N.Y. (AP) Twenty-three year-old Scott Gregory shot 22 over par – dead last in the opening round of the U.S. Open – and then cheerfully answered every question from a group of reporters wanting to know what went wrong. Phil Mickelson, Rory McIlroy and Jordan Spieth, who have won a dozen majors among them, dodged the media after finishing a combined 25 over for the day. Mickelson finished the day at 7 over as he tries to win the only major in the Grand Slam that has eluded him. McIlroy shot 10 over. Spieth was 8 over and then gave a statement to the USGA that was distributed to reporters. Gregory finished the day five strokes behind the second-to-last golfer, Michael Hebert. The 92 was the highest score at the U.S. Open since Felix Casas shot 92 at Bethpage Black in 2002 but short of J.D. Tucker’s 107 at the Myopia Hunt Club in 1898. The 2016 British Amateur winner guessed that he hasn’t shot in the 90s since he was 15 years old. But he insisted that he will remember the week more for getting a picture with Woods, who finished later at 8 over, than his first-round score. Mickey DeMorat got off to a good start in his professional career. DeMorat, who qualified for the U.S. Open after finishing his senior season at Liberty University, shot a 2-over 72 on a day when many longtime pros struggled at Shinnecock Hills. The score would have been even better had DeMorat not hit the wrong ball out of the deep fescue on No. 14. DeMorat’s previous big tournament was the 2016 U.S. Amateur, where he missed the cut. He said his goal is to make the weekend in his first pro event. Russell Henley seemed to have his shot-making under control while shooting a 1-under 69 to share the lead after the first round of the U.S. Open at Shinnecock Hills. Now he needs to make sure he keeps his mental game sharp for three more rounds. He didn’t do such a good job of that last year, when he was tied for seventh, four strokes behind the leaders, heading into the final round at Erin Hills. He was even par through 11 holes on Sunday before posting two bogeys, a double and a quadruple in the next four holes. He shot 79 and dropped to 27th. Former PGA champion Rich Beem isn’t in the field, but he helped out Dustin Johnson by stepping on his ball in the deep Shinnecock rough next to the sixth fairway. 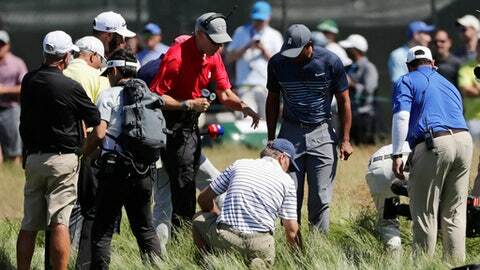 About 30 people – TV crews, volunteers and even Tiger Woods – spent several minutes helping Johnson look for the ball. Beem, who is working for Sky Sports, eventually stepped on it. Johnson chose to hack out to the fairway instead of trying to carry the water and made a 5 for bogey. Tiger Woods benefited from a rule that doesn’t penalize a player when his ball moves on the putting green accidentally, such as from the wind. Woods set the putter down behind his ball on the 10th green and then backed away when he noticed the movement. He called over a rules official, who allowed him to replace the ball without penalty; he made the putt for par. Under the rules before 2017, even incidental movement not caused by a player would have been a one-stroke penalty. Every golfer made it to the course in time on Day 1 despite traffic that had players worried someone would miss his tee time. With the 15-mile trip from the official players’ hotel to Shinnecock Hills taking two to three hours during the practice rounds, the USGA warned players to leave extra early for the course. A golfer who is late for his tee time is disqualified, and traffic is no excuse. There was an accident that brought the roads just west of the course to a halt early in the afternoon – too late to affect the players but a problem for late-arriving fans. The USGA said both lanes were blocked and advised media to skip the 2 p.m. shuttle. Scott Piercy was in the first group to finish, sending him to the clubhouse as the leader with a 1-under 69 that held up for the rest of the round. He has social media to thank for that. Piercy lost five balls in four holes before cutting his practice round short on Wednesday. Then he went back to his room and studied some pictures he had posted on Instagram to see what was wrong with his swing.